The fastest way to schedule a plumbing appointment is to pick up the phone and call (410) 836-0118 right away. You may also use this online form and you’ll be added to our appointment schedule and we will call you to confirm your appointment. A $29 deposit is required for all appointments. 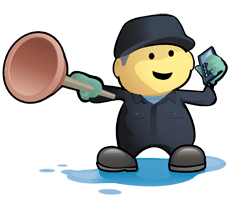 The $29 will be credited back to you when you order any plumbing services from us. There are Two Steps to schedule an appointment. Step One: Fill out the form below; Step Two: Pay $29 using our secure online payment system. Appointments will not be set in our schedule until payment is made. Ready to begin? We look forward to serving you! If you have any questions or comments, contact Chris Larichiuta.